The spat in the All Progressives Congress (APC) over its recent primaries is not abating as Governor Rochas Okorocha of Imo State yesterday threw some jabs at the party’s National Chairman, Mr. Adams Oshiomhole, accusing him of nepotism. 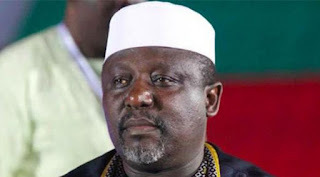 The national chairman had at the weekend explained that the governor, along with three others, had been offended by his refusal to do their biddings, specifically saying Okorocha was particularly angry because he had refused to assist him to establish a political dynasty in Imo State. But Okorocha reacted to this charge of nepotism yesterday in a statement by his Chief Press Secretary, Mr. Sam Onwuemeodo, and said it was Oshiomhole that was the “father of nepotism,” accusing him of promoting his relations into several political offices in Edo State. “To say the least, Adams Oshiomhole is the “father – father” of family dynasty or nepotism or “familiocracy,” he said, refuting the allegation that he was sponsoring his family members to take over Imo State. He explained that his preferred, Mr. Uche Nwosu, though his in-law, was not from the same local government with him. “Uche Nwosu is from Nkwerre Local Government Area, while Rochas Okorocha is from Ideato South Local Government Area,” adding, “They have no relationship aside the in-law issue.” He explained that the only relation he had in government was Mrs. Ogechi Ololo from Owerri North. “There is no other direct or indirect relation of Okorocha in his government. So, as it stands now, Rochas is the only Okorocha running election,” he explained. On the other hand, he said, the party chairman had allegedly fixed his direct relations in government position in Edo State. According to Okorocha, “But Oshiomhole is the known family dynasty builder. And Edo State is the victim. In fact, he is the architect of “familiocracy”. Oshiomhole is the National Chairman of APC and governor for eight years. Rilwan Oshiomhole, his younger brother, is a Commissioner in Edo State Oil Producing Development Commission (EDSOPEDEC). Seid Aliyu Oshiomhole, another younger brother, is the House of Assembly candidate for Etsako West 2 State Constituency. Yakubu Oshiomhole is the Secretary to the Local Government Commission; Dr. Cyril Adams Oshiomhole is vying for the House of Representatives for Etsako Federal Constituency. “With all these, between Rochas Okorocha whose only relation in government is Ogechi Ololo from Owerri North and Adams Oshiomhole who has the Oshiomholes in government or contesting positions, who should be accused of building a dynasty or running a “familiocracy”? Okorocha insisted that Nwosu won the Imo State governorship ticket of the party fair and square, and accused Oshiomhole of manipulating the process to produce a different outcome. Meanwhile, the APC has concluded plans to appoint a caretaker committee to run the affairs of its Rivers State chapter pending the conduct of fresh congresses, THISDAY has learnt. The caretaker committee will replace the state executive of the party sacked by the Supreme Court in its recent ruling. Also, as part of the moves to resolve the intra party crisis in the state, the national leadership has considered offering its senatorial ticket to Senator Magnus Abe, who emerged as the gubernatorial candidate of a faction of the party in the state. THISDAY gathered that the national leadership of the party has been consulting with the various factions in the state to ensure that the composition of the caretaker committee is acceptable to all. Following the ruling of the Supreme Court that voided the APC congresses in the state, the APC National Chairman, Mr. Adams Oshiomhole had said that a fresh congress would be held to choose new sets of party executives at all levels in the state. However, it was learnt that the party had been trying to reconcile the warring factions and see how it could unite the two groups under the Minister of Transportation, Mr. Rotimi Amaechi, and Senator Magnus Abe. A reliable party source told THISDAY yesterday that as part of moves to resolve the intra party crisis in the state, the national leadership has considered offering its Senate ticket to Abe. “The NWC is offering to grant Abe the Senate ticket using the substitution window so that he can accept to work with Mr. Tonye Cole as the governorship candidate,” he said. Although the Abe-led faction was said to have rejected the offer, the source said the party had enlisted the presidency and some governors to intervene in resolving the dispute. There were fears that if the issues were not amicably resolved it might lead to further litigation, which could threaten APC’s participation in the governorship and legislative elections in 2019. Efforts to get the party to confirm when the new caretaker committee would be in place was not successful as there was no response to both calls and text messages sent to the National Publicity Secretary of the party, Mallam Lanre Isa-Onilu. The Supreme Court had nullified the May 19 to 21 congress of the APC in Rivers State. The apex court described the conduct of the congress as a “serious violation of court order,” referring to an order of the High Court, which was ignored while conducting the APC congress in the state.